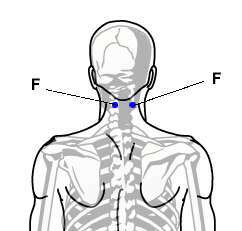 There are the acupressure points for relieving Hot Flashes. Working on these points can help you get better quicker. You do not have to use all of these points. Using just one or two of them whenever you have a free hand can be effective. Location: At the base of the ball of the foot, between the two pads. Benefits: Relieves hot flashes, fainting, and convulsions. Location: Directly between the eyebrows, in the indentation where the bridge of the nose meets the forehead. Benefits: This point helps the endocrine system, especially the pituitary gland, and relieves hot flashes, hay fever, and headaches. Benefits: Relieves hot flashes as well as chest congestion, breathing difficulties, asthma, coughing, anxiety, and depression. Location: On the center of the breastbone three thumb widths up from the base of the bone. Benefits: Relieves hot flashes as well as nervousness, anxiety, insomnia, depression, and emotional distress. 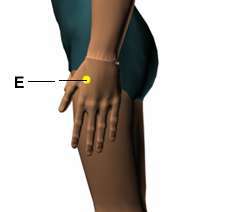 Location: In the webbing between the thumb and index finger at the highest spot of the muscle when the thumb and index finger are brought close together . Benefits: Relieves hot flashes and is a trigger point for arthritis in the hand, headaches, and toothaches. Location: Below the base of the skull, in the hollows two or three inches apart depending on the size of the head. Benefits: Relieves hot flashes as well as headaches, dizziness, stiff neck, neck pain, injuries, trauma, shock, hypertension, and irritability . 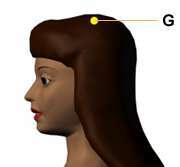 Location: On the crown of the head in an indentation or “soft spot” between the cranial bones. To find the point, follow the line from the back of the ears to the top of the head. Benefits: This point improves mental concentration and memory; relieves headaches, hot flashes, and heatstroke.